Henn-na Hotel may appear to be some kind of theme park at first glance, but it’s a real place that you can book for just $80 per night in Sasebo, Nagasaki, Japan. 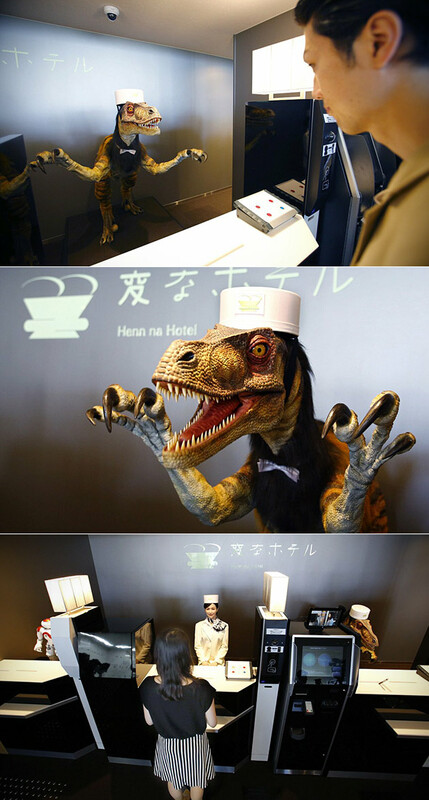 When guests check in, they’re helped by a well dressed dinosaur that says, “If you want to check in, push one [on the touch screen.” An automated trolley delivers your luggage to the room, while a small robot answers questions about the current time or weather. The temperature of the room is kept comfortable with technology that detects body heat, and guests can even call for robotic room service using a tablet instead of a phone. Click here to view the first image in today’s viral picture gallery. Continue reading for the five most popular viral videos today, including one of the iPhone 8 being pit against the Samsung Galaxy S8 in a salt water test. 3. Will This Spider Bite?